Anyone owning two or more vehicles. • Registration is paid for all vehicles in the fleet at the same time each year with a single payment. • You choose the expiration month (month of payment) that best suits your finances. • One PERM (permanent) tab is issued per vehicle, which is not replaced at the time of registration renewal. • One registration is initially issued per vehicle as usual but is not replaced each year. • You pay your annual fees, and the process is complete.
? For heavy-weight vehicles over 55,000 lbs. gross vehicle weight, you must include a copy of IRS Form 2290 (Federal Heavy Vehicle Use Tax Form with Schedule I) that has been filed with the Internal Revenue Service.
? Normal emissions testing and insurance requirements apply. A one-time $2.00 identification fee is charged for each vehicle when it is added to a fleet. ?Will my vehicles still have to be emission tested? ?How are fleet vehicles renewed? Each year you will receive a renewal notice with a list of all vehicles that are currently registered in your fleet. • If you have changes: Make any corrections/updates or delete vehicles. • Return the renewal information to Fleet Services, and they will send you a new payment invoice. • Or, visit any Desert Title location to make changes and pay the updated renewal fee. We will quickly take care of you. • If you have no changes: Just make your payment online (after completing any required emissions tests as usual). ?Can I make partial payments? No, the entire amount must be paid in full. ?How can I make my registration payment? 3. In Person: Go to any Desert Title location and we will quickly take care of you. There is no appointment needed. ?Is there a charge for replacing a lost registration or plate? The charge for replacing a lost plate is $5.00, plus postage/handling. 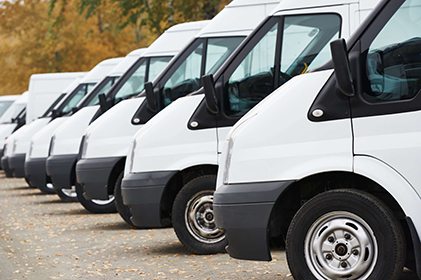 There is no cost to replace a lost or damaged permanent fleet registration document. ?I am ready to create a permanent fleet account. What do I do now? Just come into any Desert Title location, fill out your application, and we will quickly take care of you. There is no appointment needed.